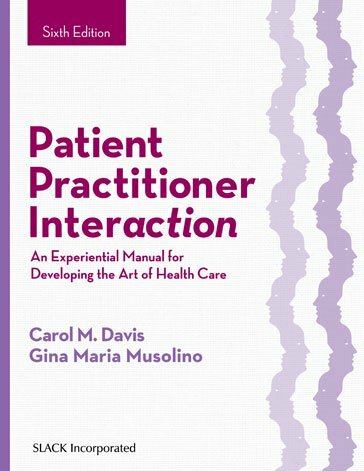 For over 20 years, Patient Practitioner Interaction: An Experiential Manual for Developing the Art of Health Care has been the cornerstone textbook for health care professionals to learn and develop effective interpersonal professional behavior. Building on the foundational knowledge of past editions, the updated Sixth Edition continues to teach health care professionals how to develop self-awareness and communication skills critical to providing ethical, compassionate, and professional treatment and care for and with their patients. Drs. Carol M. Davis and Gina Maria Musolino designed the textbook to assist both faculty and students through instructional and learning objectives emphasizing the importance of self-awareness in patient interaction. The Sixth Edition guides faculty in teaching the essential component required of all health care professionals: the ability to know oneself and one’s patterns of response in highly contentious situations. Through the featured learning activities and chapters on self-awareness and self-assessment, students will be able to better understand, change, and evaluate their learned patterns, values, and readiness for mature patient interactions for both typical and challenging patient care situations. The learned skills of self-awareness and effective interpersonal communication allow clinicians, faculty, and students to provide compassionate and therapeutic treatment and care for the good of the patients and their families. Developing health care providers are also guided in new focus areas in health care leadership and advocacy through interactive exercises. Interactive and online learning activities of real-life clinical situations and vignettes with tools provided to use in the classroom to make learning active and engaging. New content areas addressing leadership and advocacy professional and community organizations; and self and peer assessment for fostering reflective professional development. Instructors in educational settings can visit www.efacultylounge.com for additional material to be used for teaching in the classroom. Patient Practitioner Interaction: An Experiential Manual for Developing the Art of Health Care, Sixth Edition will continue to be the go-to resource for students, faculty, and clinicians in allied health professions for effective patient interaction. Carol M. Davis, DPT, EdD, MS, FAPTA, is Professor Emerita of the Department of Physical Therapy in the Miller School of Medicine at the University of Miami and past Vice Chair for Curriculum. She retired from her academic responsibilities in 2015. Dr. Davis is an internationally known speaker and consultant in teaching and developing curriculum in professional behaviors, attitudes, and values and in complementary therapies in rehabilitation for physicians and all health professionals. In addition to being the author of Patient Practitioner Interaction: An Experiential Manual for Developing the Art of Health Care, Sixth Edition, she is the editor of Complementary Therapies in Rehabilitation: Evidence for Efficacy in Therapy, Prevention, and Wellness, Fourth Edition, also published by SLACK Incorporated, and co-editor of Therapeutic Interaction in Nursing. Dr. Davis continues to teach doctor of physical therapy (DPT) students at the University of Miami Miller School of Medicine as volunteer faculty. She is an international invited lecturer on the structure and function of fascia. She has published several research articles in peer-reviewed journals and is the author of 18 book chapters. She served 6 years as a commissioner on the Commission on Accreditation for Physical Therapy Education and was a team leader and site visitor. She also served on the Ethics and Judicial Committee for the American Physical Therapy Association (APTA) and was Chair in 2004-2005. She was awarded the Outstanding Teacher award by the Section on Geriatrics of the APTA in 2003, was named the 2005 Linda Crane Lecturer by the Sections on Cardiovascular and Pulmonary and Education, and was awarded the Lucy Blair Service Award in 1991 and the Catherine Worthingham Fellow award in 2003 by the APTA. In addition to teaching and consulting, Dr. Davis maintains an active clinical practice, primarily treating patients with pain using J. F. Barnes sustained myofascial release and exercise. Dr. Musolino serves the APTA Education Section as President (was Vice President for 2 terms) and the Editorial Boards for Journal of Physical Therapy Education and Journal of Allied Health. Dr. Musolino is senior reviewer for APTA’s journal Physical Therapy. She also served on APTA Appointed Work Groups: Honors and Awards, Education Awards Committee, Screening Proposals/Abstracts, and Annual Conference Program Committee. Dr. Musolino also serves as Chair, Research Committee, and Board of Directors member of the APTA Health Policy & Administration Section: The Catalyst. Dr. Musolino has served the Florida Physical Therapy Association (FPTA) as Assembly Representative for the West Central District of Florida, Delegate; APTA House of Delegates, member Florida Consortium of Clinical Education; on Task Forces for Temporary Licensure and Continuing Competence; and as former Vice Chair of the Southwest District of Florida. In 2012, Dr. Musolino was honored with the prestigious Lucy Blair Service Award from the APTA for exceptional service to the association. She is currently FPTA Chief Delegate, Florida, to the APTA House of Delegates and Board Member of the FPTA. Dr. Musolino also chairs the APTA Neurology Section, Advocacy & Consumer Affairs Committee; and serves as Federal Affairs Liaison. Dr. Musolino is a clinical mentor for the USF SPTRS student-run BRIDGE clinic for underserved/uninsured patients/clients. Dr. Musolino is an APTA Advanced & Basic Credentialed Clinical Trainer, educating clinical instructors throughout the nation and Florida for physical therapy and interprofessional health care instruction.